It’s hard to focus on the bright side of life when you’re too busy trying to be perfect. My first two weeks of university have been challenging, exciting, interesting, and overwhelming. That on top of coming to the other side of the world, painting and cleaning a new house, switching on to the news, trying to understand how New Zealand works, and learning to drive on the left. I’m trying hard to do all these things perfectly, getting exhausted and not having much fun in the process. But no matter how hard I try, I’m still miles behind the fantasy perfect version of myself. The dream: I wake up fresh after a good night of sleep. I shower and get ready quickly to have time for a healthy breakfast and some quality time with my fiancé over coffee. My lunch for the day is ready because I conscientiously prepared it the night before. I arrive at uni at 8 am (half an hour early) to avoid traffic and find a parking spot right away. I use this half hour to read the local paper, the national paper, and the online news. The reality: I wake up tired and grumpy because I haven’t slept enough. I beg Nick to put some rice on for my lunch while I get ready. I spend too much time in the bathroom, and would rather be late than sacrifice eating breakfast. I end up running out at the last minute, leaving a big mess behind. I arrive at uni at 8.15 and park miles away. I still have 15 extra minutes that I spend checking my emails, Facebook, and Twitter, or texting friends in Europe. I go jogging twice a week and attend at least one yoga class a week. I go out sometimes but never drink too much and always go to bed at a reasonable hour. I blog once a week, and stay active in the WordPress community. I compose memorable tweets several times a day, but also make room for romantic tête à tête with my fiancé and cook regularly. I haven’t been jogging for 6 weeks, I haven’t updated my blog for 2 weeks, I don’t have enough mental energy to check my friends’s blogs and comment on them, I never know what to write on Twitter, and I don’t even remember last time I cooked. Nick has to deal with my mood swings and my bad temper in the morning. I often have one more glass of wine, and eat too much chocolate. I ask intelligent questions and make thought-provoking comments in class. I pass all the tests with flying colours. I have tons of ideas for news articles and start working on them right away after class. I’m anxious about saying anything in class because of my accent and my general ineptitude. We had a news quiz last week and I scored half. A point. Out of ten. I have 3 ideas for possible articles, but I just don’t know where to start. Meanwhile, I’m reaching proficiency level in finding excuses not to call my contacts: there’s too much noise around, it’s too late, it’s too early, I probably won’t understand what they say on the phone with their kiwi accent, and they won’t understand what I say either- what’s the point? I’d better give up journalism altogether if I’m realistic. Whatever I achieve, my failures always take more space in the picture. As soon as I get a new skill, it becomes normal. Maybe I should focus on my abilities and achievements instead of comparing myself with a fantasy perfect version. It’s okay to skip a reading if I listen attentively in class and catch up on the reading later. It’s okay not to know where to begin reporting on my stories- I wouldn’t need to attend the course if I was able to fire off amazing articles already. And I might not have been cooking or exercising enough lately, but I painted a whole house afresh, found a job teaching French at the local Alliance Francaise, and got used to driving on the left. So next time I’m getting exhausted running after the perfect version of myself, I’ll try and remember to look on the left side of life- what I achieved, like learning to drive on the left. Fun. that’s the element my perfect-me is missing. If I were perfect, fun would be planned and timed. But fun doesn’t work like that. And fun is important because it’s often in the spare moments that things become clear: hearing about a potential story while out for dinner, understanding a media law concept while reading something for fun, and laughing enough with a friend during a break to renew the necessary energy to be attentive in class. I probably won’t stop running after perfect-me. But I’ll try and remember to look on the left side, and to have fun. This is great Blog. Actually this is my first time reading one of your blog or any other, I enjoyed it. I read about the Law of Attraction and I’m giving it ago I want to fullfil my dreams on day and I hope it work just like it worked for you. I can SO relate to feeling scattered, not good enough, cranky and too serious! It’s exhausting, isn’t it? I think a big part of it is being back in school and not having “me” time. I want to cook, blog, and have the energy and positivity back that I used to have. Maybe part of it is finding fun and flexibility in the new schedule. It will take creativity, no doubt, but I think it can be done. I think you’re right, we have to start by not being so serious and so self-critical. At any rate, I’m with you (although I’ve had fewer life changes than you), and I can empathize. Take care, Cecile. Big hug! Hi Tobi, sorry for the late reply. I’m glad I’m not the only one feeling that way. I agree, going back to school and having less “me time” makes me cranky. I also tend to ditch fun to be able to finish what I have to do first. I’m sure you’ll find ways to create space for the things that matter to you. And I hope you’ll find time to blog, too :-) Hugs back. I think we’d all have that huge gap between ‘the dream’ and reality, we just don’t set it out as clearly! maybe I should! I applaud you for openly discussing your fears and struggles as you adjust to a new life at university and driving on the left. As you continue to feel more comfortable in your new world, your dreams and reality just may find themselves to be blending together. You have already accomplished so much, Cécile, and I know that you are nowhere near finished with all you can do. Just keep on keeping on and I’m promise that it will all become a little bit easier everyday. Just had a chance to read this. Great post. I’ll admit, the fun me is more fun than the serious me. The left side is more interesting for sure! Just stay positive and good things will happen. You writing is terrific! Also, I never know what to say on twitter either. Thanks for your support, Jill :-) Glad I’m not the only one losing her wits on twitter. Not at all. It makes me feel old. Love this, Cécile. I mean holy crap, can I ever relate! I’ve felt very much the same way. Always, always measuring my real self against my perfect image of myself. Whew, it is exhausting. It drains me of joy. I adore the expression, “look on the left side of life.” Such a clever play on words. I am always looking to the right, trying to gauge whether I’m doing everything right enough, but that would imply there is a wrong way. And there isn’t, there is just another direction… left! Let’s keep looking on the left side of life! 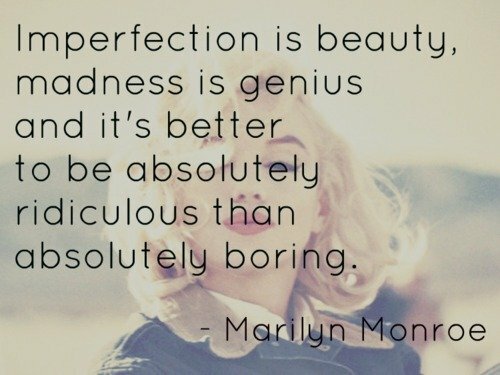 You already know the truth: perfection is totally boring. From where I’m sitting, it sounds like you’ve already accomplished a lot and are acclimating pretty well. Think about when you last moved in Switzerland — you probably didn’t follow your regular morning routine the first day. Changing houses/apartments is stressful enough. You’re on THE OTHER SIDE OF THE WORLD. Cut yourself some slack! It’s when we put ourselves up to perfection that we have problems. We are not perfect. I know that I have come across to some here in real world as perfect and have it all together. They are seeing one part of me and that part is seen from their inability in that area. You are right; have fun! You must. You will be working over 33% of your life and sleeping enough to use up over 1/w your life. The little that is left is spent doing things to help the other two! Do have fun…make it fit into your life. Btw- if you were in my class and I heard that accent, I would not be able to concentrate on class – that’s me, but it’s true. Thanks for sharing your insights on perfection, Scott. Letting go of perfection and making room for fun seems like the way to go. My experience of moving around countries is that the culture shock lasts for a couple of months – everything feels negative and nothing seems to go right. Give yourself more time to adjust and settle in – I reckon it took me 6 months before I felt settled in Philly & Basel. Heck, I even had culture shock coming back from London to Scotland (and I come from Scotland!). Take time to lay down foundations of your new life. Don’t feel you “have” to settle quickly. I’m definitely still adjusting to the culture shock. The accent problem is just in my head, I know that. Many people confirmed that they could understand me really well, but I can’t help feeling shy because of it when I have to speak in front of an audience. Huge achievements by the sound of it Cecile. I drove in Italy and STILL can’t believe I was brave enough to do it – not only the wrong (sorry, OTHER) side of the road, but ROME!!! Insane. So don’t undersell your achievements. Lovely post as always. Thanks, Lisa Rose. Rome! I’m used to driving on the right but I wouldn’t want to try there. Excellent idea! If you get overwhelmed, break it down in small bits and check off your list. It is an exciting time! Enjoy! Love this post, and so glad to hear from you. I figured you’d be running around like crazy & adjusting to life as a journalism student. My post for this week is also about perfectionism, so we must be on the same wave length! I am what you would call a ‘recovering perfectionist’ so I’m constantly battling with the ideas in my head of how things should look and how they actually *can* look. In the last couple of years, I’ve finally figured out that mistakes make things way more interesting. It’s great that you’re documenting these moments–just think what future Cécile will make of all of these adjustments. I’m sure she will have a good laugh and think about how far she’s come! P.S. I’m so impressed by your new driving skills–I am terrifed of driving on the left side of the road and haven’t yet attempted it on a South Africa trip. I just let Grant drive. Maybe one of these days! I had no choice for the driving: we live half an hour drive from university and I have classes every day. I tried to convince Nick to become my private chauffeur but he didn’t like the idea. I hate driving in general, so I was terrified the first times I drove on the left. But after a week and a few frights, I got used to it. I thought it’d be much harder- you should give it a try next time you go to South Africa. Just a thought. It always boggles my mind that a French girl whose native language is French can write a blog in English better than most native English speakers. Keep looking on the left side Cecile. You have accomplished so much in such a short time. My money is on You! I fight this sense that I’m doing it all wrong. I wonder how much easier life would be if we’d accept that reality us IS perfect us. Thanks for the enjoyable post! Thanks for your comment, Michelle. We might not get out of our comfort zone as often if we just accept our reality as perfect. I guess it’s a matter of balance- pushing ourselves, but not too hard. This made me laugh. Yeah, fantasy me is much more impressive too. But constantly trying to live up to her is exhausting and not worth the effort. I figure as long as we do the best we can, then we can accept that as enough and enjoy our lives. Glad it made you laugh, Stephanie :-) Doing the best we can prevents regretting not having done more later at least. Excellent Cecile. Keeping to the left sounds like a very good way to live. I will ponder on it more:) .